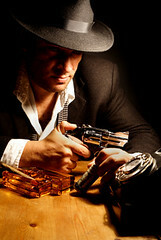 Are VC’s seen as gangsters? I think venture capital is one of the most exciting industries because it is one of the fundamental levers of capitalism, starting and running a company. The VC has a very important role in facilitating the development of ideas. After working with entrepreneurs at MaRS, I have been lucky to get a bit of insight into the industry. However, during a discussion about the cost of capital in my MBA strategy class, my professor brought up the point that VC funding is very expensive. In fact, she ranked it up there with borrowing money from the mob! How could you compare VCs with the mob? Venture capital investment is touted as one of the first opportunities a new entrepreneur should identify. She explained that, by the time your company has reached a successful size, your piece of the company will have shrunk to a minuscule slice. This is because start-ups will require multiple rounds of financings before truly “making it.” She also argued that most venture capital firms are looking for an exit strategy that will monetize their investment. On her list, the cheapest forms was your own personal money, followed by friends and family, typical banks, angels, VCs and then the mob. Her argument has some merit but without any investment, many innovations would never see the light of day. Suzie Williams from Canadian Venture Capital Association has also written a blog in defense of the image of venture capital. I, for one, am still in the VC’s corner as a key player in funding and creation of new companies.